The German DAX may open higher today after ending deep in the red the yesterday on concerns about global growth and trade. US stocks recovered from sharp losses to close higher overnight and bringing back a little optimism to global markets. In political news however things look slightly different, with UK Prime Minister Theresa May heading for emergency Brexit talks with German Chancellor Angela Merkel on Tuesday after canceling the parliamentary Brexit vote that was due today. The DAX ended Monday's session closing at 10622 which is the lowest closing price since December 2, 2016. After tumbling €166 prices are confirming their strong downward momentum in the short-term. A rally back into the Bollinger Band today though is possible as some positive sentiment has returned to global markets following the impressive recovery in US stocks last night. 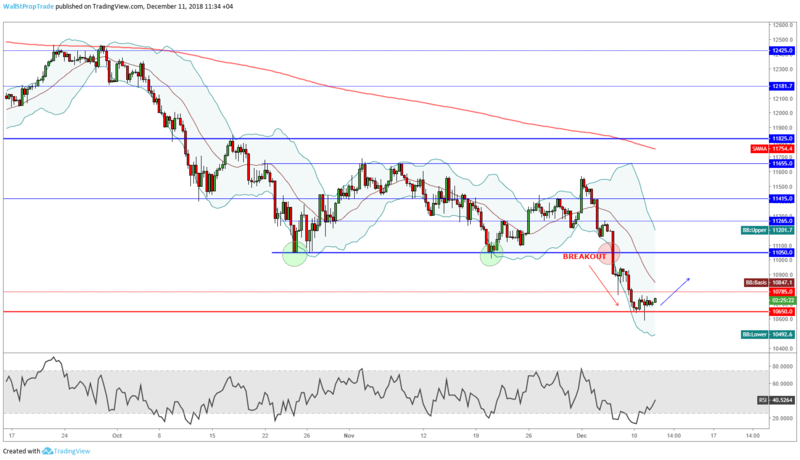 This could signal a potential change in momentum that might lead to a correction back up towards the center of the Bollinger Bands and resistance level at 11050.